73-year-old animator Hayao Miyazaki has announced that "The Wind Rises", his latest film, nominated for an Academy Award, will be his last. It's sad news. Audiences have flocked to see his beautifully imagined and lushly magical films since "Princess Mononoke," his first international hit in 1997, and the worlds he has given us, the colors and sights and sounds, the plots and characters, create a powerful legacy. 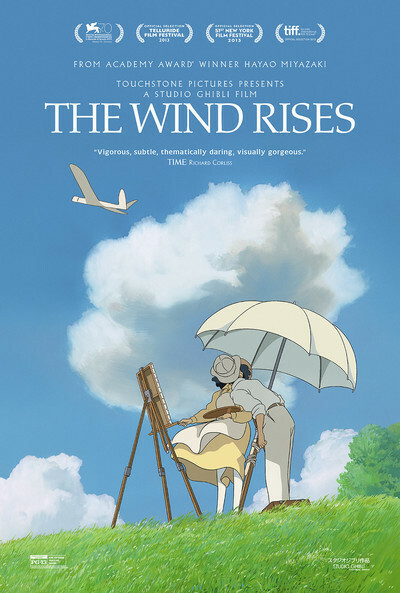 In "The Wind Rises," the fictionalized story of Jiro Horikoshi, Japan's World War II airplane designer (he was responsible for designing the lethal "Zero" fighter plane), one character says, staring up at the racing clouds in the sky, "Airplanes are beautiful dreams." Miyazaki's films are beautiful dreams, too. His presence is already missed. Young Jiro Horikoshi is a nearsighted boy who has fantastical dreams of flying airplanes, swooping above the green fields of his country, the landscape unfurling below him like a magical land of possibility. Being a pilot is closed to him due to his eyesight, but he decides to go to school to be an engineer and design those "beautiful dreams" for others to fly. Through this endeavor, he is encouraged by an Italian aircraft pioneer, a Count Caproni, who is a muse-like character appearing to him in dreams, showing him the glorious possibilities of flight and the gigantic flying machines he has built, giving the young Japanese boy a sense of how far one can go in one's imagination. The dream has to come first. The reality will then follow. This is how it has always gone with those who push technology forward. Jiro's quest is single-minded, but not so much so that he does not notice the upheaval in the world around him. Jiro mourns that Japan is "backward," they are 10, 20 years behind the rest of the world, they still need to use oxen to pull the aircraft out into the fields for a test run. They make their planes out of wood, not metal. How could they ever compete with the technological powerhouses of the world, like America or Germany? Additionally, there is political and economic unrest, desperate peasants swarming towards trains passing through, throngs of people flocking to the cities looking for work. After getting a job with Mitsubishi, Jiro is sent to Germany as a delegate, to learn about their airplane technology, to get tips and ideas to bring back home to Japan. All of this takes place in the 1920s and 1930s, as the world arms up for war. "The Wind Rises" is a mild anti-war film (in an early scene, when Jiro beats up a school bully, his mother scolds him saying, "Fighting is never justified. "), perhaps too mild, considering its topic. But Miyazaki sticks close to Jiro's journey, following him through his dreams, his schooling, his investigative trips to Germany, and his sweet courtship of the girl Naoko, who will become his wife. Still, with all of that, "The Wind Rises" has an uneasy undercurrent about what these "beautiful dreams" will become when used in warfare. Planes then turn into nightmares, raining death down on the people below. In Jiro's dreams, the sky is filled with airplanes, swooping and colorful, like big fanciful paper birds, or benevolent bright dragons, harmless and buoyant. As the film moves on, and as Mitsubishi competes for contracts with the army and navy, he realizes that what he is doing is designing a killing machine. There were many like him in his generation of early aviators and airplane engineers. Man had dreamt of being airborne for centuries. To defy gravity, to soar through the air—what an example of what humanity can do if it just dreams big enough! When Charles Lindbergh flew across the Atlantic Ocean in 1927 and landed successfully in France, former Secretary of State Charles Evans Hughes commented on the event: "We measure heroes as we do ships, by their displacement. Colonel Lindbergh has displaced everything." The hopeful possibilities of flight soon descended into the horror of World War II, where airplanes played such a ferocious role. Many who designed those planes had moral qualms about what they had helped unleash. "The Wind Rises" portrays these moral qualms, when Jiro's dreams suddenly turn dark and ominous, when the pretty swooping biplanes suddenly morph into threatening heaving monsters bursting down through the turbulent clouds. Jiro's problems are technological in nature, and "The Wind Rises", similar to "The Aviator", patiently takes us through his various breakthroughs in construction and design (he gets an inspiration for curved wings from looking at a mackerel bone). The Zero fighter plane, which put Japan on the map in World War II, was a long-range aircraft with a high degree of maneuverability. By the end of the war, technology had developed so quickly that the Zero was left in the dust by other fighter planes, and Japan resorted to using the Zero mainly in kamikaze operations. The film has been criticized for glorifying the deadly Zero, for glorifying Horikoshi and whitewashing some of the more problematic elements of his career. You could certainly make that case, and the soft-pedaling of what the Zero actually did in the war, and how it was used, is the only weakness in the film. We must try to live." Wind is in every scene, both figuratively and literally. The winds of war are already blowing at the beginning, and so are the winds of change. Japan must "catch up" to the rest of the world, and Jiro is part of that push. Wind also represents the breath of life, the breath caught in Naoko's TB-infected lungs, but as long as breath exists, there is hope. Wind races across a pond causing ripples, it rips umbrellas out of people's hands, it pushes against an airplane's curved wings, helping it to stay airborne. Wind is both benign and ominous. The images in "The Wind Rises" are breathtaking, with one striking scene after another, imaginative, whimsical, powerful. There are a couple of magnificent sequences, one being the Great Kanto Earthquake of 1923, the most powerful earthquake in Japanese history at that time. It devastated Tokyo and the surrounding areas, and the fires that erupted following the quake turned into a raging firestorm, which leveled miles of the city. The scene unfolds in an eerie and terrible way, the ground buckling and cracking, houses sinking into the depths, power lines sparking as they topple over. The landscapes are suffused with poetry and beauty that almost aches, and the cloudscapes are like an undulating Maxfield Parrish sky, the sunset-lit clouds rearing up into mountains with planes swooping around the peaks. In "The Wind Rises", we are given a portrait of a bespectacled thinker and dreamer, a boy obsessed with the inner workings of machines, and the way things are put together, a boy who looks around him and understands that what he fantasizes about can become a reality. The same could be said for Hayao Miyazaki, and in a way, "The Wind Rises" is his most personal film.